This card stock foldout was inserted into the daily Variety in 1982. When I got my own copy I called Variety to see if they had any left that were not inserted into the newspaper. They did and I went over and bought them all. So, these are in unused condition and have been stored in a large plastic bag for over 30 years. Item is in very good condition with some minor wear to the edges as I received them. 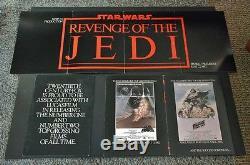 I have displayed 3 inserts so that you can see how the insert opens up and what is on each side of the page to the full fold out of the announcement of "Now In Production" originally named "Revenge of the Jedi" and the world premier date. Full foldout size is approximately 15" x 43 1/2". A very collectable Star Wars item as only a certain amount were printed. Star Wars material, especially something like this that is a "recalled title" for the saga is skyrocketing in value as each new episodes is released. It looks phenomenal framed with the big red letters "Revenge of the Jedi" against the black background. I have thousands of titles - from the 20's to the 90's - so submit your want list!! You are purchasing an original movie poster from the collection of Sue Heim, owner of Hollywood Poster Frames. As the owner of Hollywood Poster Frames, my company has done the framing for the studio's, academy's, production houses and private collectors all over the world for over 30 years. I have a vast collection of original movie posters so please feel free to send me any questions or lists of titles you may be looking for. Thank you - Sue Heim. The item "Revenge of the Jedi Star Wars Original Movie Poster Insert Hollywood Posters" is in sale since Sunday, August 02, 2015. This item is in the category "Entertainment Memorabilia\Movie Memorabilia\Posters\Originals-United States\1980-89". The seller is "suesmovieposters" and is located in Bellingham, Washington. This item can be shipped to United States.